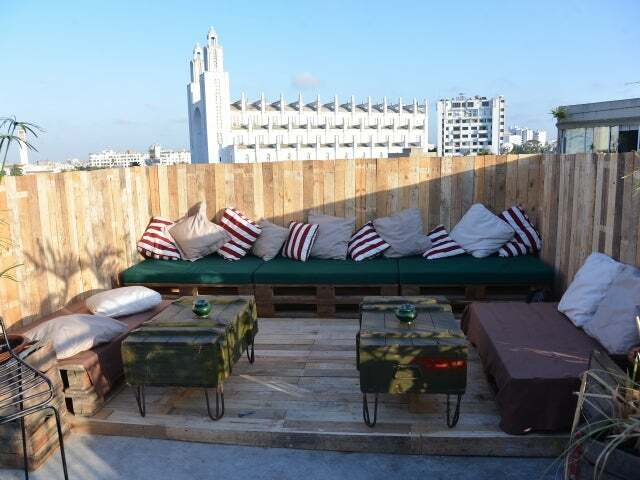 The Jame’s Rooftop is the only rooftop bar in Casablanca and is one of the latest additions to the 5 stars JM Suites Hotel in Art & Deco neighborhood. The Jame’s Rooftop is the only rooftop bar in Casablanca, exclusively designed to match the Jameson Irish Whiskey identity. It is one of the latest additions to the 5 stars JM Suites Hotel, located in the center of the city – in the Art & Deco neighborhood – with a spectacular city view. The place offers a wonderful view on the main landmarks and monuments of Casablanca and gives its guests the opportunity to enjoy a variety of drinks and burgers in an Irish-like, friendly, trendy and warm atmosphere. You might want to try their Jameson Ginger & Lime cocktail as an easy and refreshing drink for the hot nights of Casa. If you are in the summer, you must make the most out of the positive vibes of this season at this place. They offer a wide range of spirits and cocktails at a reasonable price in addition to various international meals. Booking is advisable if you want to really enjoy the Casablanca rooftop view.